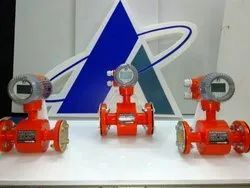 Our product range includes a wide range of cpc electromagnetic chemical detector, cpc helical flow meter, cpc oval gear flow meter and cpc fuel consumption meter. The CHT100F Helical Flowmeter is positive displacement meter which is specifically designed for high viscosity fluids. The SS body helical Flowmeter can be used for all hygienic applications. The CHT100F Flowmeter is available in integral as well as in remote optimal. Our CT 100F Oval Gear Flow meters are designed for high viscous fluids measurement. The application of these flow meters include flow metering of oils, syrups and fuels. Our specified design minimizes the slippage between the gears and the measuring cavity wall resulting the oval meter to be less affected by liquid’s viscosity and lubricity. Oval Gear Flow Meters ideally measures the fuel consumption of genset applications; that reads fuel flowing to the engine providing a total fuel consumption as well as the fuel usage in Ltr/hr. This is done by installing one flow meter in genset inlet line & another one in genset outlet line and one fuel calculator which will show you the total consumption of genset by subtracting the inlet minus outlet.